There are many different types of trifle recipes. If you grew up with the version that contained tinned fruit, packet custard and was sprinkled with hundreds and thousands, you might be surprised to know that it is actually an ancient and venerable dish. The word trifle comes from “trufle” an old French word meaning something inconsequential. The earliest desserts made using this name, towards the end of C16th, were actually what we would now call fools; i.e. a mixture of cream and puréed fruit – the words trifle and fool were interchangeable for a long time. Cover your dish or bowl with Naples biscuits broken in pieces, mackeroon broke in halves, and ratafia cakes; just wet them all through with sack, then make a good boiled custard, not too thick, and when cold pour it over, then put a syllabub over that. You may garnish it with ratafia cakes, currant jelly, and flowers and strew different coloured nonpareils over it. As to whether this, a quite different style of trifle to that which had previously borne the name, was indeed the invention of Hannah Glasse there is some debate, but in the absence of proof to the contrary, she must take the credit. And so it became established that the English trifle is made with sponge cake, soaked in sweet sherry (sack), real egg custard and syllabub (cream whisked with alcohol – usually sherry or sweet wine). The debate as to what can be included in an “authentic” trifle is a passionate one and the sort of discussion that is too rarely encountered in Britain. 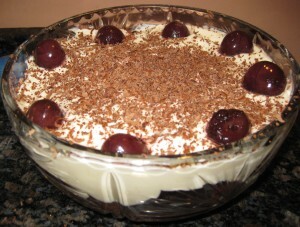 Jane Grigson, writing British Cookery in 1984, gave the trifle recipe from Jonathan’s of Oldbury in Gloucestershire, which won the Trifle Competition organised by the AA in 1983. She comments that it is a deserved winner on account of there being no flour in the custard, a topping of syllabub, and not a glacé cherry in sight. In 2001, Helen Saberi and Alan Davidson published their research on the topic in the book Trifle which remains the most comprehensive work on the subject. In response to this publication, Slow Food organised trifle tastings as described by Sarah Freeman in the second edition of The Best of Modern British Cookery . The first of these tastings endorsed the superiority of Swiss Cream, a version of trifle that enjoyed some popularity in the Victorian era, whilst from the second of these tastings emerged a winning trifle recipe from Silvija Davidson. All of these recipes can be found here. Part of the difficulty in defining what constitutes a trifle is that the concept lends itself to many variations. You will have noted that the English Trifle is a very alcoholic dish indeed and this aspect gave rise to some of these variations. Many of these contain the word “tipsy” as in Tipsy Pudding, Tipsy Squire, Tipsy Hedgehog or Tipsy Cake. These can be traced to the English settlers in the United States. They settled mainly in the south, where the southern planters loved this rich dessert. Tipsy Parson was so named because of its popularity with the preachers who visited on a Sunday. Similar recipes are found in several European countries, for example Bizococho Borracho (Drunken Cookie) in Spain. Zuppa Inglese , from Italy, means English Soup, the name and style acknowledging the dessert’s association with English cooking, however, more recently Italy introduced its own variation on the theme with Tiramisù. The Jane Austen Centre in Bath provides some helpful background information about developments in food in Georgian times, especially concerning sponges – the base that is essential to a trifle. Beaten eggs had begun to replace yeast as the raising agent for cakes, and fatless sponge-cakes were all the rage as evidenced in a letter from Jane Austen to her sister in 1808 where she wrote “You know how interesting the purchase of a sponge-cake is to me”. The earliest sponge cake recipe in English was recorded by Gervasse Markham in 1615 but these sponge cakes were thin and crisp, more like modern biscuits. Among the more popular in the 18th century were the European styles of sponge cake known as Biscuit and Genoise, both of which used cornstarch in place of some of the flour giving a closer textured cake that tended to be dry and so was often moisten with syrup. Naples Biscuits were made with the same batter but poured into individual moulds and were actually pretty much what we would today call Savoiardi Biscuits or Ladies Fingers. Whilst a homemade, fatless sponge certainly raises the bar as far as the quality of a trifle is concerned, bought Savoiardi biscuits are perfectly acceptable. If I am making a sponge for a trifle I actually like to make it as a Swiss Roll, filling it with jam. Using freshly ground almonds in place of flour for the sponge is also, in my view, a nice enhancement. You will notice in Hannah Glasse’s original recipe for trifle that macaroons and ratafia biscuits are also included and either of these make an excellent additional layer that prevent the overall trifle becoming too sloppy. Liquor: typically Sherry and/or Brandy, but I frequently vary this to echo the overall flavour theme of the trifle. Fruits: fresh, puréed fruits or compote can be used whilst fruits preserved in liquor are ideal, providing two of the essential ingredients. Sometimes the fruit is added in the form of jam, which should be used sparingly. The low-sugar raspberry jam recipe I have given is a great way of getting a relatively fresh but intense fruit flavour. Jelly: The inclusion of jelly as the second layer, often with fruit set within, is the most strongly divisive topic of debate vis-à-vis trifles. I had imagined that this was a modern departure until I saw it included in many old recipes. I should have remembered that wine jellies were another popular 18th century dessert and it does provide some stability to the structure. However, to my taste the texture of jelly is completely alien in a creamy trifle and I never include it. Custard: Homemade with fresh eggs is essential if custard is to be used at all (and it is traditional). Jane Grigson stipulates that no flour must be used; it should be thickened entirely with egg yolks. However, this results in a very eggy custard which is still quite runny, so I wouldn’t object to a single teaspoonful of cornflour! In fact, as my husband is allergic to eggs, I usually substitute the custard with mascarpone – as used in Tiramisù, and actually prefer this. Syllabub: This could warrant a book of recipes of its own. Syllabubs are absolutely delicious, far superior to just a whipped cream topping, and the wine or liquor used can be an essential part of the overall Trifle flavouring. Syllabubs predate Trifles, but in the seventeenth and eighteenth century there were three types – one in which the milkmaid would milk the cow into a punch bowl containing cider or ale, sweetened with sugar and spice; and a second type made with wine and spirits instead of ale or cider and cream in place of milk. The second type was thicker than the first but both resulted in a separation between the cream and the whey and alcohol, which was drunk rather than spooned. At some stage it was discovered that if you reduced the proportions of wine and sugar to cream the whip would remain without separating and thus the third version – known as an”everlasting syllabub” was born. 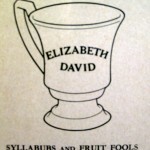 Elizabeth David gives her own recipe for Everlasting Syllabub. My own introduction to syllabub came in 1983 with the publication of Katie Stewart’s Cookbook. Very much a collection of recipes, it contains no opinion and no history, instead letting the recipes speak for themselves. Speak to me they certainly did, and to many of my contemporaries. Her recipe for Syllabub with strawberries was ideal for the beginning of the strawberry season, when prices were high, as she made 8 oz of strawberries serve 6 people! Nowadays I may increase the quantity of strawberries but the recipe remains a faithful standby. The syllabub served with the strawberries uses medium-dry sherry but she also gives a recipe for a wine syllabub, which is in very similar to Elizabeth David’s Everlasting Syllabub only without the brandy and nutmeg and twice the quantity of sugar. Toppings: Here you can let your artistic side run riot. Ratafia biscuits, fresh flowers, candied fruit or petals and chocolate shavings are just a few examples. Don’t decorate a trifle until just before serving or you run the risk of colours bleeding or the toppings sinking. Trifle bowl: early trifle recipes mostly suggested making it in a large china bowl but pretty quickly the Trifle Bowl itself became an important part of this showy dessert. It needs to be glass so that the layers can be seen, and preferably a good lead crystal. Some are bowl shaped but many are raised on a stand, so that the layers can be more easily admired! However, a bowl set on a stand cannot be as large as one without, and many trifles are made to feed 12 people. The bowl you use will determine the quantities required of each ingredient, so bear this in mind when looking at recipes. Finally there is a question of whether the bowl should have straight or convex sides. Straight sides do make it easier to arrange fruits around the edge.